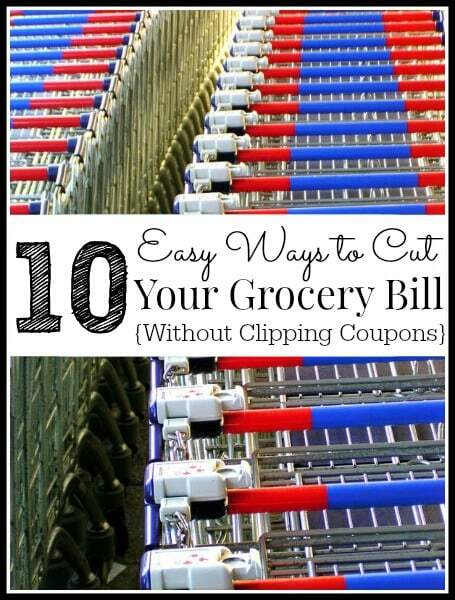 Don't have time for clipping coupons? Here are 10 easy ways to save money on groceries without using coupons. We all want to save money at the market, but many of us don’t have time to be extreme couponers and need simple ways to save. 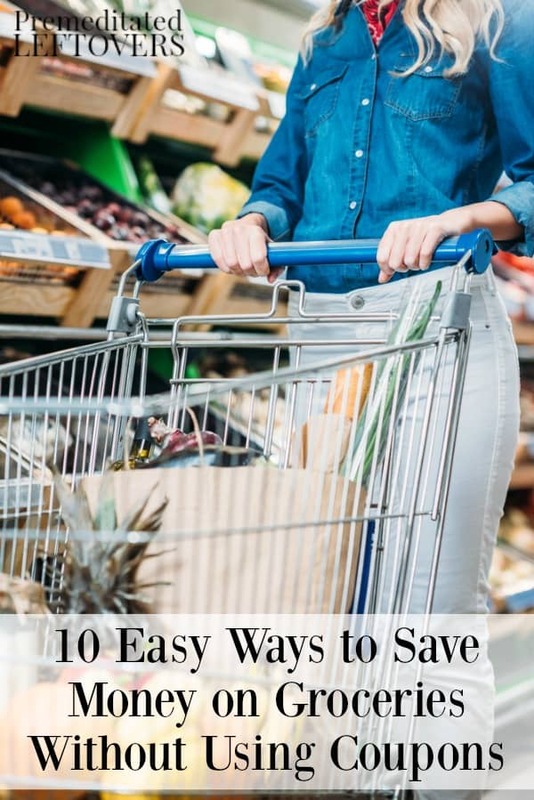 In this post, you will find 10 ways to save money on groceries and have more left over for other things! 1. I can’t say enough about how much you will save if you plan meals. Planning meals not only saves you time and keeps you more organized, but it also allows you to not overspend and waste food. After you have made your meal plan from items that you already have on hand, make a list of the items you need and find the best sales on those items using the Favado App. 2. Keep your kitchen and pantry clean and organized. If it is, you are less likely to be tempted to eat out when you are tired. Here are tips for organizing your pantry. 3. Never, ever shop hungry or tired. You are far more likely to do impulse buying because everything will look tasty to you and if you are tired, you are more likely to buy expensive convenience foods. 4. Look for ways to skip convenience foods where it will make a huge price difference. For instance, soup is much cheaper and less full of sodium when you make it yourself. Popcorn is much cheaper when you pop it yourself in an air popper rather then buying microwaveable bags. 5. Don’t be brand loyal. Ketchup is virtually the same no matter what brand, for example. Don’t be afraid to use generic brands for generic things like mustard, oats, and rice. At the same time, watch for sales. Don’t assume the store brand is always cheaper. 6. Only buy in bulk when it makes sense. Don’t do it when you don’t have space or need for a large amount just because it is cheaper. It isn’t in the end if you waste it. One thing that is almost always cheaper and takes up very little space is bulk spices. 7. Don’t just go for eye level products at the market. Look on top shelves and bottom shelves. Many times, retailers put the most expensive things at eye level so you just grab them. The cheaper products may be just above or below eye level. 8. One of the biggest money eaters, especially in the summer is beverages. Make your own when you can and by all means, avoid convenience drinks. Like Iced Tea? Make your own for a fraction of the cost! 9. Another summer tip is to make sure you check out local produce at the Farmer’s Market. Often times, the prices are cheaper and you are supporting local farmers. 10. Don’t be afraid to go meatless once a week. Just cutting meat out of your diet one day a week can save a family of four an average of $20 a month or more. 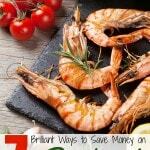 Looking for more ways to save money on groceries without using coupons? 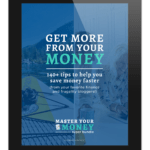 Check out Stop Clipping & Start Saving: A Practical Guide to Saving Money Without Coupons for more ideas. This is great advice! Oddly enough, ketchup is one food where I AM brand-loyal; we buy only ketchup made with sugar (not corn syrup) and we think Simply Heinz tastes better than the others in that category. But for a lot of foods, I agree, the brand makes no difference or the cheap brand is even better. The linked article on menu planning is great. It’s important to consider what you already have and what’s on sale when making your plan. Just yesterday I read someone’s post about how “menu planning wastes money”–because she was using a one-month plan over and over again without regard for seasons–of course that doesn’t work so well! For me, planning has helped a lot to make sure we use up perishable ingredients, and it can save time when we prep something (like cook rice or grate cheese) for multiple meals at one time. I have lots of meatless recipes on my site! We eat fish every couple weeks and no other meat, and that definitely saves us a lot of money. Becca, I agree, I will not buy Ketchup with hfc!!! Thankfully, there are a few that don’t have it. My Shoprite supermarket even makes an organic store brand ketchup that is hfc free. So I do have some options when it comes to pricing! I recently found this site and am impressed with its very practical, easy-to-follow advice. 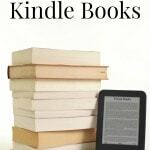 If anyone will take these suggestions and deliberately use them, your pocketbook will be amazed! There are some other things I have learned to do over the years that have cut my grocery cost. – Don’t take family along. If any of the family goes along, they feel they can also shop, so I rarely take them. I deliberately set aside time to take and teach my children in quality, quantity, reading labels for content (additives, salt, corn syrup, hydrogenated oils, coloring, MSG, etc and why I don’t buy those), and comparison pricing. As young teens I had them make simple menus they could prepare so they began to get a handle on shopping and cooking…they are now amazing adults at stretching money and cooking. – If they went when I was shopping, they were given jobs for finding and filling the grocery list. – I always convert everything into price per ounce. Dividing ounces into cost gives me cost per ounce. This takes time and probably a calculator, but will shave off pennies per item when comparison shopping. You also know when the size has been down-sized! Paper items depends on sizing on number of sheets. – The best ads of the year run just prior to Thanksgiving and I have made the room to buy many staples for the year at that time. Turkeys (sometimes free; and if I split the cart with two checkouts that is sometimes two free turkeys) are at the lowest price to put into the freezer. Other holidays have their own specialties. – Gardens (even apartment dwellers can have a couple of pots with tomatoes or herbs) for fresh produce, as well as canning, are a gold mine, give children jobs and pride, and is good for the health. – I didn’t know how to make soup but found some recipes and then improvised my own…most start with either a broth or tomato base. The broth I buy either as a can. as cubes to be dissolved, or left over meat and broth. There is also soup base in jars in the soup aisle. For a tomato base, I use what ever I happen to have on hands…spaghetti sauce, tomato juice or paste, V-8 juice, ketchup (in a pinch), fresh tomatoes, etc. ; add all left-over meat and vegetables in the frig, herbs, seasoning, onions and garlic. If I have peppers to add, parboil them one (1) minute and they cook much faster. – I also cook in bulk and can. The expense in canning, besides time, is the equipment and jars. – Shopping at the farmer’s market will keep your menu “in season” with fresh produce and introduce you to new things. – And if you’re new at this, begin with one thing that you can easily incorporate into your schedule, then next week add another…shopping will get easier and less time-consuming as you practice. Your tips are all spot on! Thanks for sharing them with us. I’ve found that I save money at the grocery store when I plan meals in advance and make a shopping list. If I try to go shopping on the go, I can spend close to double and my family doesn’t eat nearly as well. Love the tip to go meatless. I haven’t been able to convince my husband to do that yet, but I do plan several meals a week that use less meat- like casseroles, etc. I shop at 3 places every month. I get $100 in non-perishables at an Amish-run grocery salvage store, $20 at Kwik-Star for eggs, butter, bananas, milk and bread, and about $50 at a Fareway Grocery store for fresh produce and meat. The non-perishables last much longer so once I’m stocked up, I take that allotment and buy meat on sale. Most of the time I have everything I need in the cupboard to make all sorts of recipes! Toilet paper, detergent and dishwasher tabs are a fraction of retail when purchased from Amazon Prime about every 3 months. It works for our family of 3. In the summer, I try to plant a huge garden. We eat well!